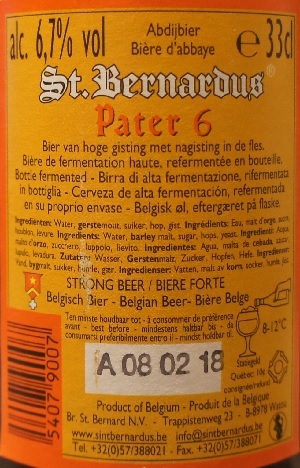 Brewer Description: (from website) St. Bernardus Pater 6 is a traditional abbey style dubbel, chestnut in color, very fruity with notes of melon and very fresh banana, finishing with slight bitterness. Intro: A 330ml bottle with a best before date of 8th February 2018. Poured into a Chimay goblet. Appearance: It was a dark brown-reddish colour with a very nice creamy two finger beige head that slowly dissipates to a thin but self-replenishing layer while leaving nice lacing. Aroma: Dark fruits, plum, fig, raisins and apple with hints of caramel. Taste: Similar to the aroma with dark fruit, plum, fig, raisins and prunes with some banana, light caramel and hints of nuttiness. Overall: The dark fruit is there, but it disappeared quite fast. Other than that, it was easy to drink, but not nearly as good as one of my favourite Dubbel’s like Westmalle Dubbel. 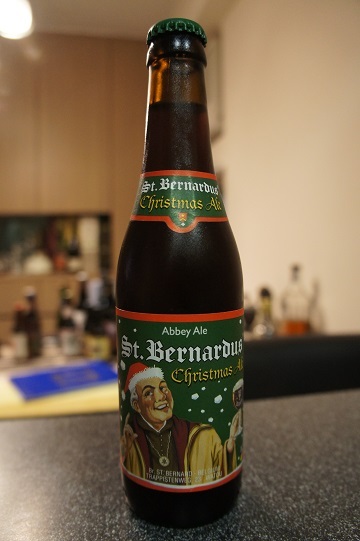 Brewer Description: (from website) St.Bernardus Christmas Ale is a dark seasonal brewed in the classic ‘Quadrupel’ style of Belgium’s best Abbey Ales. 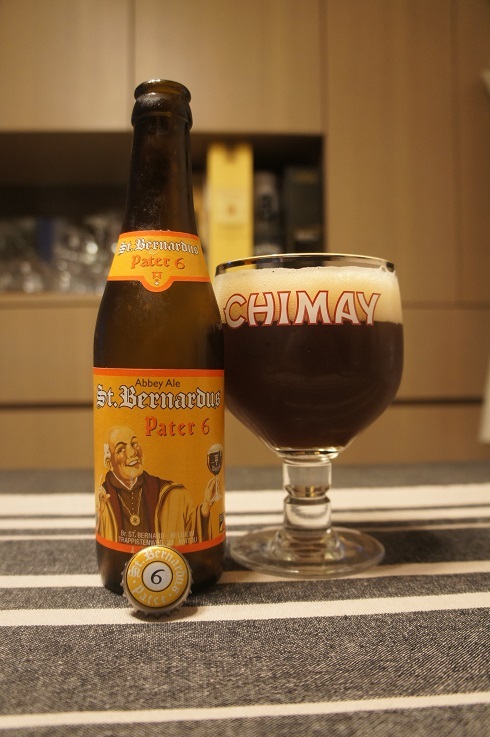 (10,0 % ABV) Similar to all the beers from our brewery, it greets the drinker with the signature aroma of the St.Bernardus house yeast strain (in use since 1946!) 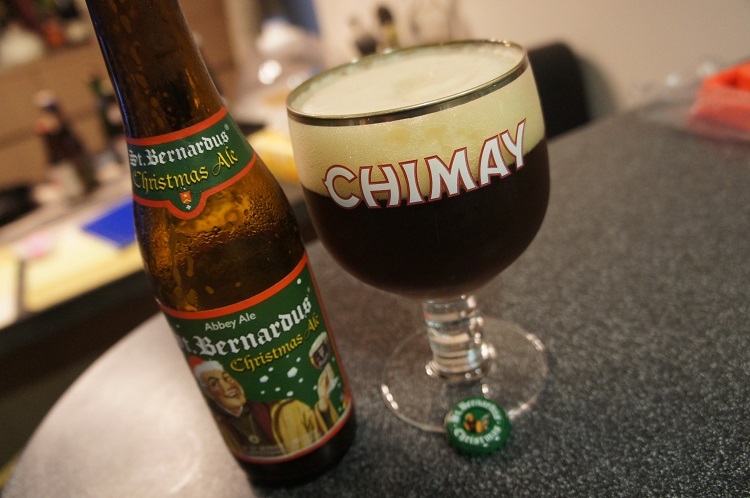 Rivaling the complexity of the St.Bernardus Abt 12, St,Bernardus Christmas Ale offers a spicy, mint-like flavour profile exuding the tastes of warming alcohol, fermented molasses, apricots, licorice and marzipan that are highlighted by the perfect balance of brewing sugars. 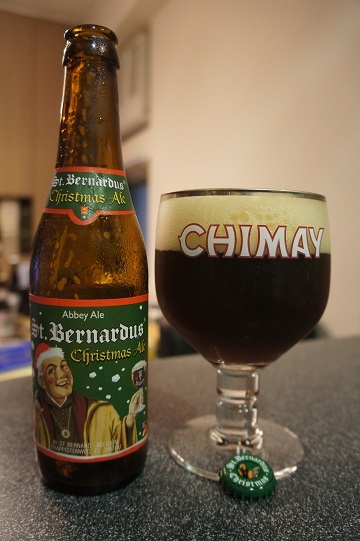 Intro: A 330ml bottle with a best before date of 30th July 2018, poured into a Chimay goblet glass. Appearance: It poured a dark brown colour with a two finger creamy puffy beige head that dissipated slowly to a nice half finger puffy cap that gives nice curtain like lacing. Aroma: Nice dark fruit cherry, plum, prunes and raisin with hints of apple, banana and spice pepper. 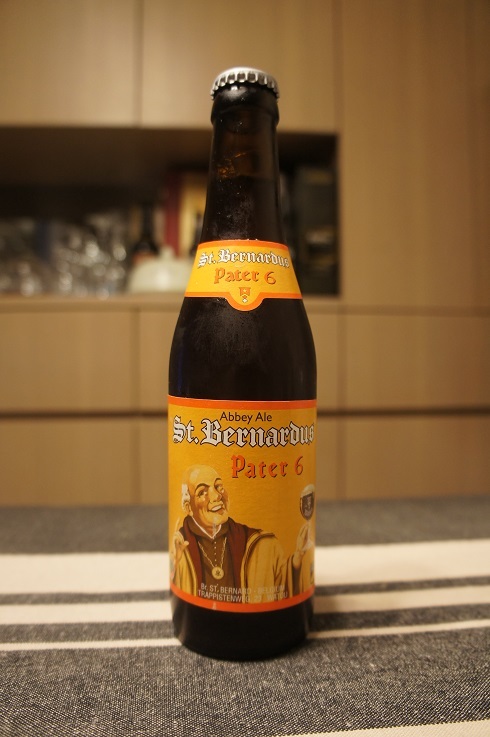 Taste: Much like the aromas, there’s candied sugar, apricot, cherry, fig, plum and hints of banana. Caramel and toffee comes out as it warms. The alcohol is there but does not affect the taste and is slightly stronger when warm. Mouthfeel: Creamy, medium bodied with mid to high carbonation. 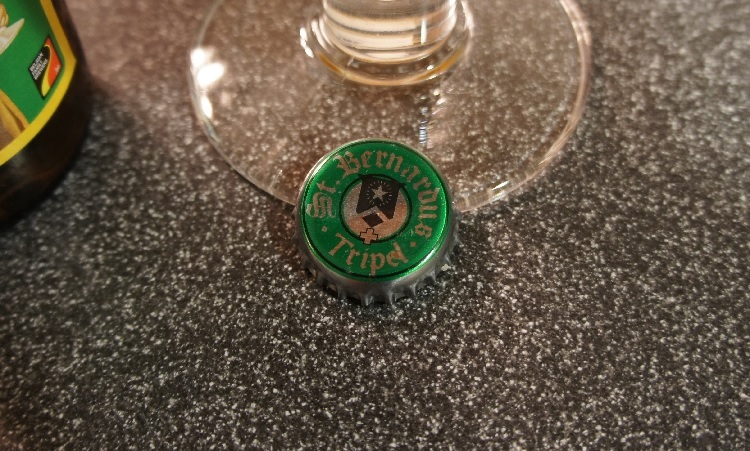 Overall: Not quite Abt 12 but it is still a great beer from this Trappist brewery that I would buy again next year. 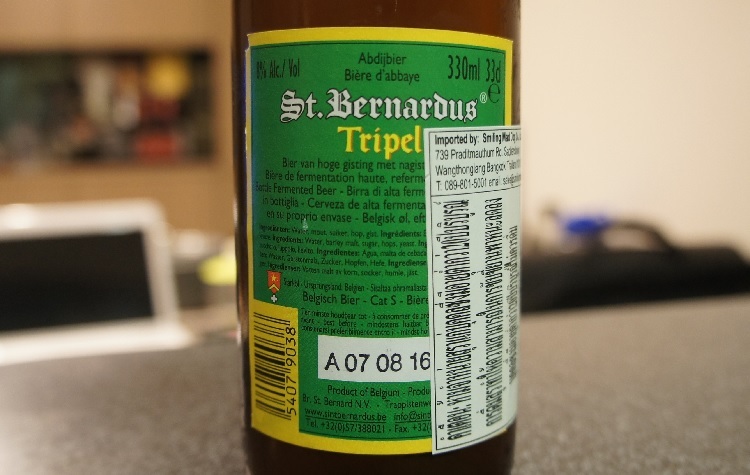 Brewer Description: (from website) St. Bernardus Tripel is a traditional abbey ale brewed in the classic “Triple” style of Belgium’s best Abbey Ales. It has a blond to pale amber color with a wonderful head, slightly sweet aroma and the orangey-grassy flavors of hops in the finish. Wonderfully drinkable and surprisingly light. Intro: Bought this 330ml bottle from Bangkok, Thailand and took it back to Hong Kong in my suitcase as mostly can only find the Abt 12 quad version in Hong Kong. 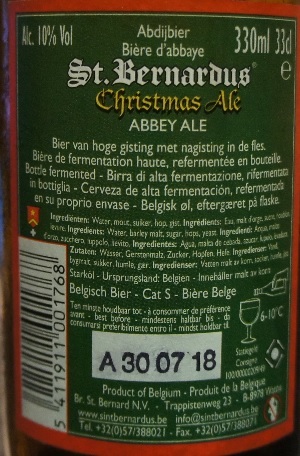 It has a best before date of 7th August 2016 and was poured into a Chimay goblet. Appearance: The beer poured a hazy murky dark gold colour with one finger creamy white head that has great retention but leaves a nice set of stringy lacing. 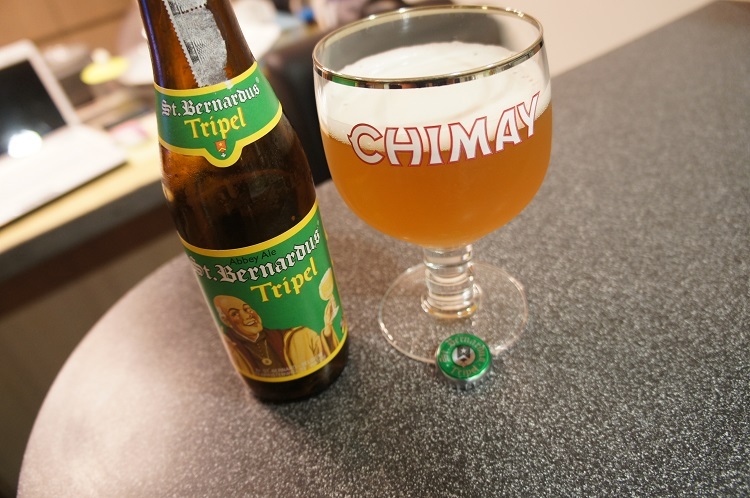 Aroma: Mainly floral and citrus lemon and lime aromas along with some bready buscuit malt. Taste: Taste is sweet fruity pear and some caramelised banana, maybe even banana bread. The bready malts come through and the finish is slightly bitter and peppery. Mouthfeel: Medium bodied, medium to high carbonation and somewhat dry. 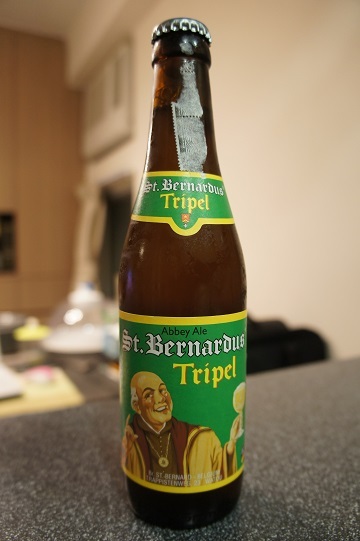 Overall: This is a pretty good tripel but not my favourite. 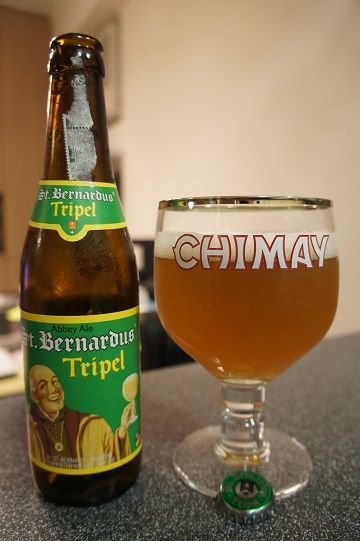 I still prefer the La Trappe and Westmalle versions more as this was less fruity overall.